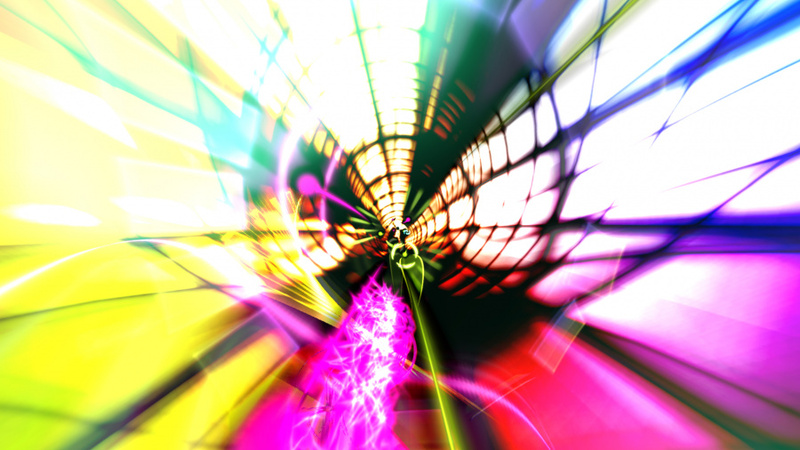 Imagine riding a high speed rollercoaster through a music visualiser. 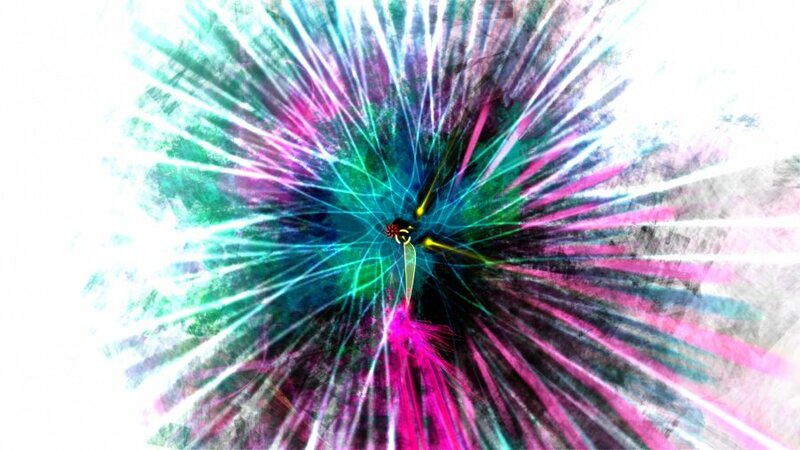 The colours zoom all around you, blending together until you can't tell what's going on or where you are. Everything swirls together in a rainbow mish-mash that makes little sense. It's confusing. It's mesmerising. It makes you dizzy. But it's extremely pretty, and when you're done you want to ride it again and again. Dyad places you, a tentacled particle, in a large hadron collider-like world that resembles the laser show of your wildest dreams. On first glance it could be compared to Rez or Child of Eden, with a little hint of Llamasoft's Space Giraffe, but it's distinct from each of these games. Rather than moving freely around the screen, or even around the entire circumference of the pipe, you're stuck on the edge of the tunnel at the bottom of the screen, moving ever-forward. You can slide up the sides slightly, but really you're rotating the tube around you. It's simple enough to begin with: you shift your little particle around with the left stick to dodge the balls of colour that make up your enemies; you hook foes by moving directly in front of them and shooting with X. Each level, however, adds a new gameplay mechanic that builds on top of this basis. Fire at two like-coloured enemies in a row and you've chained together a combo that boosts your velocity; later, hitting two of the same hue creates a zip line between them, a translucent highway to skid down at great speed. After a few levels, you can form a circle around an enemy by blasting them, which can then be grazed through to build up energy for your lance – a charging attack that sends you flying forward at a blistering pace, destroying almost anything in your path. Success is reliant on linking all of these parts, and more, together. There are a lot of systems at play here, and before long Dyad has evolved from a fairly simplistic shooter into a psychedelic haze of colour that, from the outside, looks nonsensical. But to the person actually playing, it doesn't matter — by the time you've reached that point, the mechanics have built on top of each other well, introduced at a steady rhythm that keeps the game fresh without overwhelming. Well, not unless it wants to. Dyad is well constructed to the point that, even when it sets you the task of surviving as long as possible as a level speeds up around you until literally everything is a blur, it's somehow possible to keep up with it to a certain extent. Even at its messiest, there's always a semblance of understanding. The responsive controls, combined with a wonderful mesh of blood-pumping audio and neon aesthetics, mean that you can find yourself drifting into an auto-pilot-like mind state, weaving in and out of enemies through the most chaotic kaleidoscope you've ever seen without blinking an eye. After all, in some of these stages a blink is all it could take to lose. Even the menu design is excellent. The background music and interface colours change as you flick between xylophone style buttons. You can alter the speed of the sound with the shoulder buttons and cycle through all the colours of the rainbow by messing with the right analogue stick. It's difficult to resist having a little play around every time you boot up. It's not a huge challenge to pass each level with the lowest requirement, but it's rock solid to do well. You're awarded from one to three stars when you complete a level – no stars means you lose, try again – with the maximum rank often proving tough to earn, to say the least. 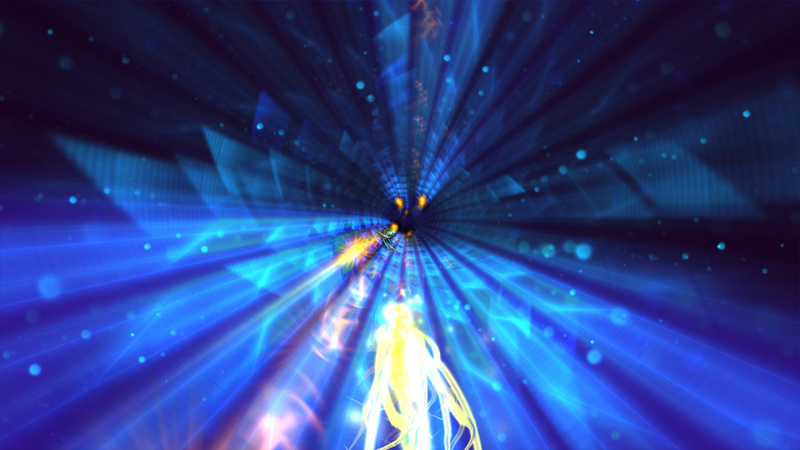 Beating a stage lets you remix it; you can play them with alternate visual effects such as inverted colours, in endless modes and fiddle with the music. Only by besting a level with three stars can you unlock its ultimate challenge, however: the chance to earn a Trophy in ridiculous trials that require pure mastery, one for each of the 26 levels. While Dyad as a whole requires you to get to grips with a wide range of systems, the Trophy stages often put your prowess with a single skill to task; they test your abilities very narrowly, and you have to become a complete master of whatever mechanic is placed before you to stand a chance of getting one of those precious metal cups. These, plus the appeal of global leaderboards, are what will have you coming back for quite a while; if you've got no interest in high scores, though, Dyad is a fairly short experience. Dyad looks tough to fathom, but with the controller in your hands it's not only a hypnotic game but also a very fair one. It pulls together audio, visual and control well, so even at its most visually confusing it rarely feels like you're not pulling the strings. And while it's possible to complete quite easily on a surface level, mastering its depths to claim all the rewards and place well on the leaderboards could take a rather long time indeed. I'm willing to bet that I'm one of the very few here that remembers playing N2O on PSone way back in the day, of which, Dyad greatly reminds me of. I'm really excited about this. Great review, Mike! Audio/visual narcotics do not a good game make. If I need to do this to help my game succeed, have I really made a good game? No, I've basically become a drug dealer. Did you know that when people take drugs at a rave party, they trip out, and when they go again to another rave party, and abstain from drugs, they still get the trip, because of the audio/visual narcotic. Makes you think, doesn't it.